So, I got to spend some time with a Kia K900 this past week. Here's the full review of the car. And yet there is a niggling little thing about the exterior styling that I find enraging in a car that costs $65,000 when nicely optioned. I'm referring specifically to the "vents" at the rear of each front fender...Kia has cut a hole in the sheet metal for the specific purpose of covering the hole with a hideous piece of plastic...At first, I didn't mind it too much. But then I started thinking about it. And I started to think about the K900's sticker price. And it began to grate on me. Now, I've gotten to the point where I want to firebomb every K900 I see, simply because of the vent. Admittedly, I am perhaps, somewhat less than perfectly objective on this whole vent thing. The K900 is also roomy in back. You could stable a horse back there. There's simply loads of room for rear passengers. Kia has also come up with the idea that right rear seat is the VIP seat, the reasoning being that, if you're being chauffeured, that's where you'll sit. So, in addition to the stereo and climate controls mounted on the rear center armrest, with the VIP options package, the passenger in the VIP seat can touch a control to move the front passenger seat forward, and fold the seat back forward. After crushing his extra security man into the dashboard, then, the chauffeured VIP can take a little jog. 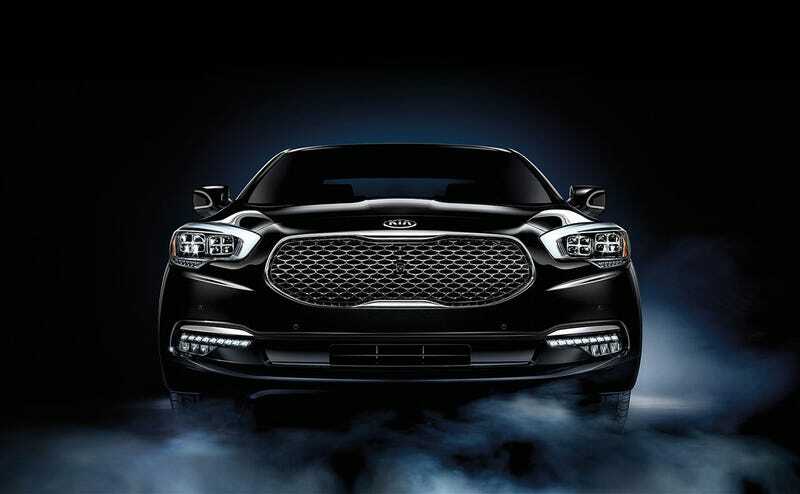 Once you get moving, though, you can tell the K900 is fast car. Or, rather, you infer it from the fact that you feel inertial forces, and things outside the car seem to be moving very quickly. But Kia has done everything that they can to spare you from what they consider the burdensome minutia of acceleration, or, what I consider "fun". Frankly, one gets the idea that Kia wishes you weren't driving at all, but rather sitting in the VIP seat, reading the Financial Times while sipping XO Cognac. Driving is for the little people, much like being squeezed into three cubic inches of space in the front passenger seat is. Anyway, it's all at the link if you're interested.